Club captain Alan Sheehan is having to practice what he preached last season after his spell out of the side recently. The 32-year-old was an instrumental part of the Luton team who promotion to League Two, being named in the SkyBet team of the year. When a team doesn’t lose, concedes barely any, scores loads of goals, when a team’s doing that, there’s nothing you can do. However, this term, he has found his first team opportunities limited, not starting a league game since the 3-1 defeat at Peterborough United on August 18 and playing a mere 81 minutes of league football since then. However, with Luton on a 15 game unbeaten run in the league and centre halves Sonny Bradley and Matty Pearson keeping 15 clean sheets since then, Sheehan accepted there was little he could do. 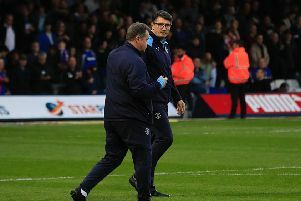 He said: “I could lie and say right now, you should be playing, but when a team doesn’t lose, concedes barely any, scores loads of goals, when a team’s doing that, there’s nothing you can do. “All you do is be there for everybody, keep everything ticking over. “I’ve played a bit off the bench and you’re only as strong as your weakest link. “When I was playing all last year, I nailed that into the boys that weren’t playing. One of the Irishman’s close friends in the Luton squad Glen Rea is sitting out for another reason, with his season ended prematurely by a knee injury. On how he took the news and the impact of replacement Alan McCormack, Sheehan said: “From September to when he got injured, I felt like he was possibly our most important player. “He was the guy who breaks up everything, he’s turned into a real leader, brilliant around the place, he’s a huge character and I was absolutely gutted for him. “I was emotional for him when we were speaking about it for the first time, but he’ll come back stronger than ever, he’s that type of character. “I was worried when it happened, but Macca’s come in and been absolutely brilliant. Thorne was joined by Barnsley midfielder George Moncur in arriving last week, and on whether Town needed further reinforcements, Sheehan added: “There’s always room for improvement, but it’s got to be the right type of character to fit into that dressing room.